Mopar's Rubicon Edition Extended Flares improve the vehicles appearance by giving it an aggressive look. 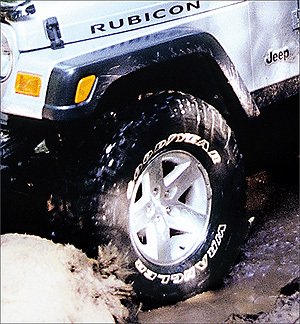 Get Rubicon styling for all '97-'06 Jeep Wranglers. Made of flexible, durable thermoplastic, these flares provide added protection from road debris and stone chips. Offered in sets of four, includes front extensions and uses existing fasteners. Paintable. Black, Same as production Rubicon. Set of four flares. Just for Jeeps has the best price out there for Mopar Rubi flares. OE fit and finish quality, which is excellent. Item arrived well packaged in a Mopar box. Just for Jeeps has the lowest price for these flares along with free shipping. Can't beat that! The flares are made in the USA and are top notch quality. The fit was perfect. The flares really rejuvenate the look of my Jeep. The flares have a smooth finish, which make them easily paintable. The extra 1" of coverage goes well with my 35x12.50 tires compared to a skinnier flares. I think the extra inch of coverage looks perfect. Any wider, and your Jeep starts looking like Dumbo.